About three weeks after my arrival in Ghana that a friend, Yao, handed me the calabash of palm wine with the directive, “Try this; it’s deha, palm wine.” I had heard much about the treasured drink that was such a staple of West Afrikans’ culture it also reigned in their literature but the frothy, milk-like liquid in the small calabash, which Yao handed me looked unappealing. Palm wine in calabash bowl. Miniature canoes of large dead ants bobbed amidst the froth. I attempted to maintain my ‘gracious guest’ etiquette of tasting almost any food offered before giving an opinion. With a puff of air I rowed the canoes to a side, said a silent prayer to the Divinity of nausea and timorously swallowed some of the wine. That was enough. The instant the sweet liquid touched my palate I increased my grip on the calabash and downed the remainder of the wine in one swig. I doubted him and was about to ask why the drink was called ‘wine’ when I tasted no alcohol in it but Yao pre-empted my question. “You will soon feel it,” he said. Of course, the born and bred Ghanaian was right. Less than fifteen minutes after lustfully gulping the palm wine I was flat on my back, fast asleep on Yao’s bed. I awoke two hours later with the unsettling recollection of the palm wine-addicted narrator of Amos Tutuola’s The Palm Wine Drinkard. Unlike the “drinkard”, I have a low tolerance for alcohol but after that first calabash of palm wine, my taste buds developed an instant love for it similar to how they have for Irish Cream. Soon after my introduction to the drink I discovered it is a good source of vitamin B complex. Naturally, my immediate thought was that my palate must have intuitively known this was the answer for the vitamin B complex deficiency of my vegetarian diet. But another recollection of the Drinkard’s escapades with nefarious characters rescinded the thought of adopting the wine as a vitamin supplement. Palm wine tastes like extremely sweet jelly coconut water but with an added zing. Truly good, freshly tapped palm wine is typically very sweet. It’s that sweetness, like the sweetened milk in Irish Cream that easily fools the novice palm wine drinker. The naturally occurring alcohol content is caused by the immediate fermentation of the palm’s sap while being tapped; nothing has been invented to halt the incessant fermentation. According to Yao, the West Afrikan fore-fathers discovered the beloved local drink through intoxicated chimpanzees. Supposedly, for days the sanguine men surreptitiously watched exceptionally jovial monkeys and were eventually led to the source of the monkeys’ pleasure, a palm tree. 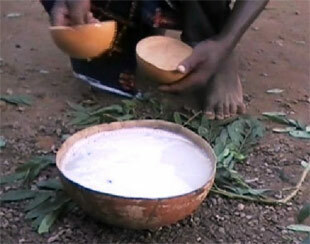 Out of distilled palm wine locals create akpeteshie—the potent hair-raising liquor like the white rum of the Antilles. When I was later introduced to palm nut soup no one had folklore on how it was discovered. It was a Sunday afternoon. I arrived home from a week of travelling to find my 75 year host, Amuno, washing the mortar and pestle. Saliva immediately rushed to my mouth. Wonderful, Amuno has prepared fufu for lunch, I thought excitedly. Fufu and groundnut (peanuts) soup is my favourite West Afrikan dish. Had I been versed in Ghanaian culinary arts I would not have jumped to my hasty conclusion that fufu was in the making whenever a mortar was out. Although a mortar and pestle are prerequisites for pounding cooked plantain or edible tubers such as cassava, into the glutinous dough of fufu, the utensils are also used in preparing the surprise dish I was about to have. In any case, fufu was definitely part of the meal but that afternoon I was in for even more of a treat. Instead of placing a bowl of the much-loved groundnut soup on the traditional low table I was seated behind, Amuno put a bowlful of a brilliantly red soup dotted with small light brownish puddles. I was mesmerized. I had chosen to eat outside under a loosely covered palm frond shed. The red soup literally shimmered under shafts of sunlight escaping through the palm fronds. “What’s that?” I asked distractedly as I pointed to the soup while thinking any food that was so dazzling must taste exceptionally good. “Dedetsi, palm nut soup,” Amuno’s daughter, Mansa, replied. Mansa proceeded to describe the soup making process but after dipping my ball of fufu into the soup and putting it into my mouth I tuned her out. The soup tasted as delicious as I its brilliance suggested! (Day old soup tastes even better than when freshly made. By then the assortment of flavours have thoroughly merged through the wonder of chemistry, creating a thicker, tastier soup.) To get to the soup the small ball of fufu must first pass through the layer of the naturally occurring red oil, which gives the dazzling colour, before meeting with the brownish broth below. As my fingers came back up through the oil to carry another moistened fufu ball into my mouth they emerged glistening burnt-orange. I first slowly licked my shimmering fingers in preparation for the fufu ball. “Good?” Mansa asked to the unconscious “Hmm,” I released while I closed my eyes to better concentrate on the delectable collision of flavours of sweet-tasting yam fufu, palm fruit oil, tender smoked herring, glutinous okra, the ubiquitous whole scotch bonnet peppers and the typical magic Amuno weaves into her cooking. With that said I again became oblivious to Mansa’s response to fully enjoy the pleasure of eating each fufu ball dipped in soup. Why, I thought, hadn’t the demonic Europeans transported the oil palm tree with the Afrikan captives to the Americas? But I promptly chastised myself that the relevant word was, demonic; no such person would have had the forethought to take along anything that provided such delectable home comfort to beings they viewed merely as chattel. The Afrikan oil palm (Elaeis guineensis) is indigenous to equatorial West Afrika but is found in Central, South and East Afrika and as far as Madagascar. It looks similar to the coconut tree but as the tree grows its straight, thick trunk becomes jagged as old branches fall or are harvested. The tree grows to approximately 20 metres in varied soil types that has good drainage and depth for extensive root growth. It requires a well distributed rainfall of at least 1,500mm annually, over 1.500 hours of annual sunshine, a monthly temperature that does not fall below 20°C and high relative humidity. The tree grows best in flat areas and does not need tilling, therefore minimizing soil erosion. An oil palm tree is productive for approximately 30-50 years. Initially, it took about fifteen years for an oil palm tree to mature before producing the prized compact clusters of fruit brunches but modern agricultural technology has shortened this to a mere three years; cross breeding the thick kernel shell Dura palm fruit with the pulpy shell-free Pisifera palm fruit has created the Tenera oil palm. This hybrid has a thin kernel shell with a bigger fruit and therefore, more pulp (mesocarp). The Tenera oil palm provides more oil than its predecessors. Compared to the original tall oil palm the Tenera is a much shorter tree, which better facilitates harvesting of the fruit bunches. Based on the numerous West Afrikan proverbs with the oil palm tree as the subject and omnipresent products created from various parts of the tree it appears that West Afrikans have made generous use of the oil palm from time immemorial. Over 50 products are said to be made locally from the oil palm tree while countless others are made globally. Virtually all parts of the oil palm tree have been found economically viable. Numerous local medicines are also extracted from practically every part of the tree. Research has demonstrated the formerly useless trunk has great economic potential for producing laminated veneer lumber. The veneer is said to be nearly as strong and flexible as rubberwood; combined oil palm trunk fibre with rubberwood resulted in a better quality of veneer. Such positive results now promise not only an environmentally sustainable product but a great relief from the nuisance of immense oil palm trunk waste build-up. Palm wine and palm oil are the most common products of the tree. In part two more on the medical and industrial uses of the oil palm.